Leoneda Inge reports on 'walk-out' and demonstration in Durham, NC to support higher wages for fast food workers. Fast food workers wearing uniforms and 'Raise Up for $15' t-shirts sat in the middle of Morgan Street in downtown Durham. 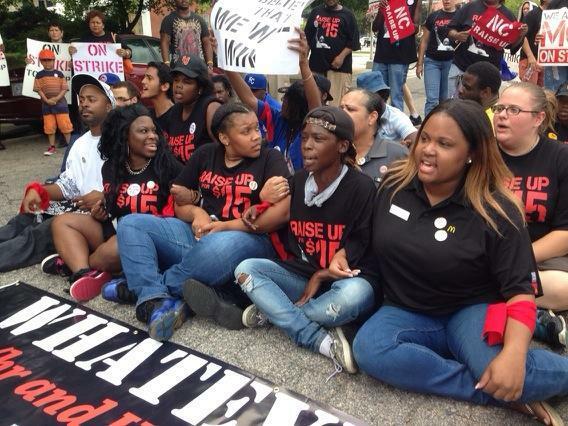 Fast food workers in North Carolina rallied Thursday in support of a $15-an-hour minimum wage. 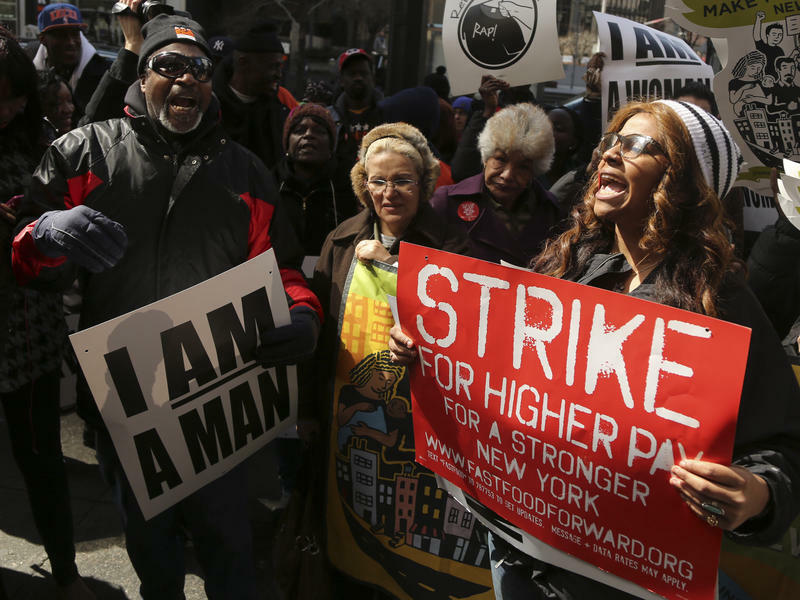 As in New York City, Detroit and Chicago, some workers chose civil disobedience. Fast food workers came from Charlotte, Raleigh and other cities to lock arms with workers in Durham. And at lunch time, right in the middle of Morgan Street, across from a McDonald’s, dozens of demonstrators sat down, and chanted. A Durham Police officer tried to clear the street, saying a fire station was nearby and needed a clear path for emergencies. The crowd did not disperse. Jerika Brown was at work inside the nearby McDonalds and decided to join the crowd. The North Carolina AFL-CIO and the "Raise Up" Fast Food Worker Association said about 200 fast food workers across the state walked off the job Thursday. In a statement, McDonald’s Corporation said they had no reported service interruptions because of the walk-outs. The company says local franchisees set wages for their workers. 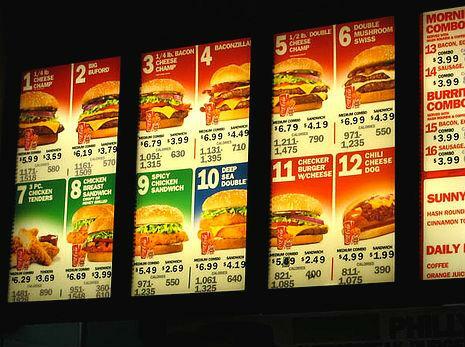 It's easy to point the finger at fast food joints. A decade after the breakout documentary, Super Size Me, the cheap, un-nutritious, happy meal is a go-to candidate for public ire when it comes to childhood obesity. But a new study by researchers at the University of North Carolina says that explanation might be too easy.